A meeting is to take place this week between representatives of the Greenbank Hotel, and Cornwall Council Planning Department. It is believed that this relates to the public amenity space on the town side of the hotel premises, known as Greenbank Gardens. Part of this open park space is owned by the hotel, and has been on a long lease to the Council, who own the remainder, for 99 years. This lease has apparently now expired, and it has been reported that the Council appear to have lost their records of the lease conditions. The Save our Foreshores group requested to have a representative attend this meeting: this request was turned down. There have recently been site surveys carried out around the Greenbank Hotel, and it is understood that the Greenbank Hotel are about to re-submit a planning application for development. Visitors to this website will recall that the two 2008 planning applications by the Greenbank Hotel were withdrawn in March 2009. We can only speculate as to the reason for this withdrawal, however it is not hard to suspect that the applicant believed they would not be successful. Whilst the 2008 plans proposed building on the waterfront area to the north of the hotel, it is believed that plans may now be being drawn up for works affecting both to the north and south of the hotel, to include some if not all of the existing park area open to the public between the Greenbank Hotel and the Royal Cornwall Yacht Club. 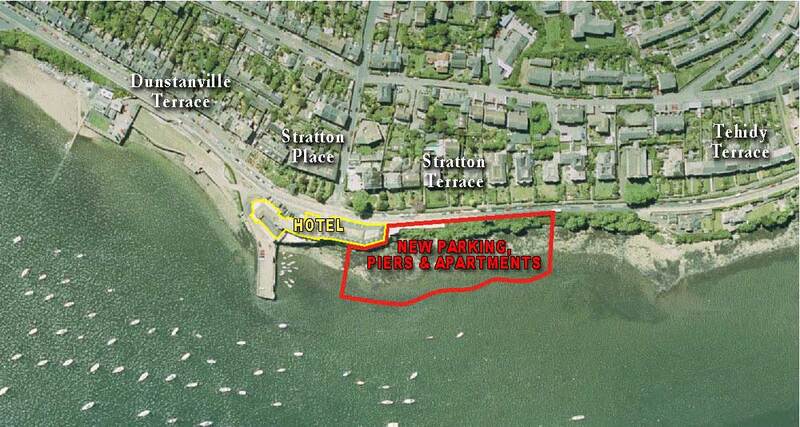 After several years of rumours circulating about the owners of the Greenbank Hotel planning to revisit earlier attempts to develop housing and/or a marina on the foreshore to the north of the existing hotel, plans were first made public in August 2008. 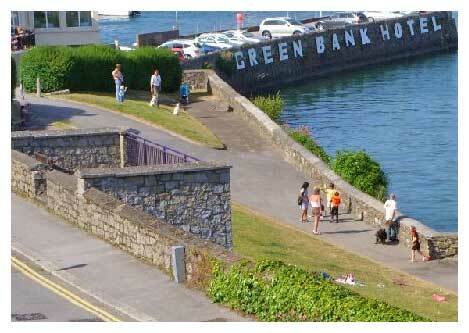 Partial plans and sketches were shown at a "public consultation event" at the Greenbank Hotel on 21st August 2008. The plans showed a development of four piers, each with two storeys of accommodation, which were described as self-catering suites and rooms. The piers extended into the river, and the total developed area of the hotel 'footprint' would more than double, with an extensive area of hotel only car parking over what currently appears as a green wooded bank. The plans were described at this public showing as provisional, and it was in mid-November that the finalised plans were submitted to Carrick District Council. The plans finally submitted had substantial detailed differences from those exhibited three months earlier, but the overall scale of the development was unchanged. The plans described the project variously as "waterside apartments", "holiday apartments", "individual holiday lets", and "rooms and suites". "The impact of this proposed development will dramatically alter the visual character of the landscape from a surviving intertidal riverine or waterfront zone to a dense pocket of modern built apartments, which although fronted by newly constructed pontoons will be of a quite different character and function to the current blend of natural and historic waterfront. The similarity of the proposed buildings along the length of the water’s edge (despite differences in roof angles) will strongly contrast with the surrounding mix and variety of building styles and uses. Their construction will shroud from view existent exposed and overgrown waterfront walling, altering the visual setting of both the Listed Quay and the immediately overlooking partially Listed Stratton Terrace. The historic setting and context of Greenbank Quay, and Stratton Terrace will as a result be changed, and adversely affected." "From Flushing the loss of this essentially green, undeveloped intertidal pocket of waterfront (see the two aerial photographs – Figs 6 and 7) to a substantial, intensively developed modern waterfront will be particularly noticeable." Many residents of Falmouth, and beyond, expressed serious doubts about the true nature of this development, and its financial viability as an hotel. There was little doubt, however, that it could quickly be substantially profitable as a development of second homes and residential apartments. The fears were that after a brief period of use as an hotel extension, an application would be made for change of use to residential units which would be sold off as second homes. however it shows the extent of the proposed development in relation to the size of the existing hotel. The area in which this modern development was intended to be set is a Conservation Area, and faces across the river to another Conservation Area in Flushing. It is directly in front of a series of Grade II listed buildings . The 2005 Cornwall & Scilly Urban Study described this area of Dunstanville Terrace , Stratton Place, Stratton Terrace and Tehidy Terrace as "... one of the most impressive waterfront façades in Cornwall." The 2005 Cornwall & Scilly Urban Study was carried out by a section of Cornwall County Council. It was funded by English Heritage, the Objective One Partnership for Cornwall and Scilly and the South West of England Regional Development Agency. This study says "...Much of the later twentieth century redevelopment on Falmouth’s waterfront has been of a massing and scale and in architectural forms which represent a major departure from the historic character of the area. While to date such development has – arguably – been absorbed without catastrophically diminishing the area’s distinctive sense of place and significance, there must be very substantial doubt whether any further large-scale, high-visibility developments could be inserted without such consequences". Photos below: Dunstanville Terrace/Stratton Place, Stratton Terrace and Tehidy Terrace, also showing the waterfront park area which may form part of a new planning application.